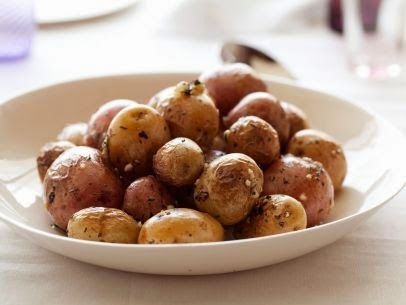 In a bowl, toss potatoes in olive oil, garlic salt and butter. Wrap in foil or place in pan and roast with prime rib for 30minutes or until tender. Remove foil from potatoes. Top potatoes with mozzarella cheese. Pop in the microwave oven for 30 seconds or until cheese melts. Top with sour cream and all purpose cream.